Date Nights with Darling Bride are beautiful, but hard to come by. Fortunately, there are Date Mornings. 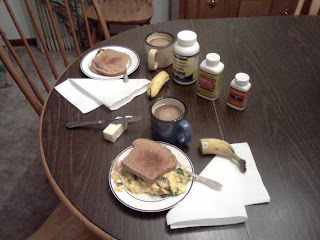 Most Monday through Friday mornings, Darling Bride and I sit down to breakfast together before I leave for work. It started, simply enough, out of logistics: I needed to eat before I left for the day, and she needed to get up and have Bible study time. So, why don't we have breakfast together? How about that? The more we do it, the more it becomes an essential part of my daily routine. The kids are still asleep, and AbbeyCat bothers us not every morning, so we have a few minutes alone to talk and get ready for whatever adventure God has for us that day. The day may be a long one, too. Not just work for me and homeschool life with the kids for her, but add AWANA, martial arts, small group, taxi service to art class, plus who knows what other things may come up, we may be on the go until bed time some days! We strive to have family dinners together too, and do pretty well with the five of us. But call our breakfasts mini-dates if you like. A quiet 20 minutes by any other name means that we continue to build a life together. Maybe you can have a breakfast date with your someone. It was the summer of 2009, when I decided that I needed to get up with you and make you breakfast. It's been a blessing ever since. I think it is especially important during taxing season as we rarely get a moment together and the kids need time with you, too. Here's to many, many more mornings together!